What is time? The term refers to the indefinite continued progress of existence and events in the past, present and future regarded as a whole. 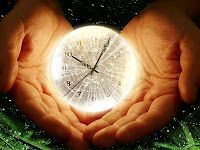 Do we 'exist' only in this time-frame of which we are now conscious of, or do we actually also exist in other time frames? The Great Einstein was a very wise scientist who believed in an undivided solid reality. He rejected the existence of the division of time such as the past and future. He proposed that there is only a single existence for "the (belief) in the separation between past, present and future is only an illusion, although a convincing one." With that, I now tell you that we are infinite beings. Time is in fact, not linear. We exist in multiple time frames, in all dimensions be it in the past, present or future. All exist NOW! Having said that, why should we limit ourselves to our current circumstances then? What exists in objective reality, is not conclusive. When we talk on the level of our physical existence, your so-called "past" determined your NOW, and what you do NOW will affect your so-called "future". Since that is so, if you are experiencing something unlovely in your life right now, it was a result of the actions in the past. And I submit to you that you can revise the past in your mind to change your current circumstances. If the tree you have planted is not to your liking, un-root it and re-plant another seed that is worthy of you! Let me give you a true life example of the power of revision. I was rehearsing some difficult dance moves for the Indian traditional dance, Bharat-Natyam, in July 2009 when I suddenly thumped my left foot a little harder that I should have and injured it. The pain was like an electrical shock. No matter how I massaged my foot, the pain did not go away. I believed that the vein must have been dislocated, so I paid a professional Indonesian masseuse to return it to its original position, but also to no avail. Nine months later, I left for Dubai and the pain was still there. Just before my all-Dubai tour, I went to a local mall with a friend wearing a sandal, which was quite high. It was uncomfortable, so I ended up buying a new pair of slippers. I had wanted to change my footwear there and then, but the seal was just too tight. My friend offered to break open the seal for me, but I declined as I did not want to trouble her. Nevertheless, she kept insisting all the way until we reached the car, but still I refused. Not long after that, as we were exiting from the car to take the Metro, I accidentally slipped and twisted my ankle. Guess what? I injured the same ankle again! That made the pain even worse than before! I had an all-Dubai tour the next day, but I could not walk properly. Each step I took was an agony as the pain shot through my entire body. Days passed, and still the pain was there. Weeks also passed, but the pain did not go away. I finally got fed up of it, and decided to do something. Since the past, present and future are all embodied within US, and the mind knows not the difference of any of these three, I could definitely ‘revise history’. Having relaxed the body, I allowed myself to 'revisit' July 2009, back in the living room of my house when I was practicing that dance. I tried to re-experience myself in my mind, doing all the dance moves once again, but instead of thumping my foot too hard on the floor, I felt myself stop praticing just before then. I played it a few times in my mind until the vision became vivid enough to convince me that that was exactly what happened. I then 'revisited' the scene at the parking lot in 2010. Instead of rejecting my friend's offer, I saw myself putting on the new slippers there and then, so I did not slip from my old sandals. After the 'revision', I forgot all about it and went to sleep. Few days later, a colleague was telling me that she too had sprained her ankle, and remembered about mine. When she asked me about my sprain, I suddenly realised that it was completely gone. For days I had not even bother myself to think about that sprain, therefore I did not even notice that the injury was no longer there. For 10 months, even with professional therapy, the pain did not leave. But a single session of 'revision' in the mind resulted in a miraculous healing! That came as a remarkable surprise as I did not even bother to check my foot if it was healed or not after revising the scenes that night. So you see, this is a confirmation that the mind is indeed limitless. We are beyond past, present and future. We can 'time travel' back and forth any time to change any residual state that we are experiencing now. A Mental Science student of mine had a very bad fall from trying to climb a wall when she was young. She had suffered from a shooting pain on the right hand side of her back for 10 years. Having visited so many specialists in the hospitals, they could do nothing to cure her back. After my lecture one day, she decided to use the same technique to revise the scene. She imagined herself in front of that same wall as vivid as possible in her mind. Instead of climbing it, she visualised herself walking away. She repeated the scene several times until she fell asleep every night for 1 week. When she woke up one day, she too had not realised when she was healed, but the pain was completely gone! You have a very beautiful and informative site! Thank you for sharing all the useful tips here. This was from the lecture the other day. Guruji, when is the next lecture? @Paema: I will update you about it. That was really inspiring. I don't exactly have a pain on my body, but I do have a burn scar that I wanted to get rid off, do you think the same power of revision would work? what if you have said something which you've regretted? can u 'revisit' those moments in your head and 'unsaid' those words? If yes, please tell me how. Thanks. ohh my comments will only be visible after approval? @Justin: Yes, if it works for bodily injuries, why not a scar? A girl had a burn few years back, scalded by hot water from a big pot, but she remembered to revise immediately. Miraculously enough, she only had red patches on her hands, and not a bad burn. @Anonymous: After you have uttered something that you have regretted, natural consequences follow. Whatever it may be, if you go back to that same day, visualise in your mind vividly the same situation, and imagine yourself saying something else instead of what you did... and the natural consequences will change. For example, if you have uttered something that destroyed a friendship, then after revision (if done properly) the friendship will naturally be the same before that 'unfortunate' incident, because when the action is absent, the reaction is ALSO absent. swell!!!! i tried this method after one of your lectures in New York and it really worked. at one point of time due to my personal problems, had been skipping lunch and suffered gastric as a result. i imagined myself always eating on time during that busy period. so, gastric could not have been a problem. after 3 days, the pain disappeared. got me thinking --> we really can amend the past! You've explained the existence of 'time' in the simplest manner possible. I love your examples. It makes us question whether what we have always known to exist, really exist at all? Thank you for opening up my eyes.